To make the new e4 way of building a complete model from small model pieces – named fragments – more flexible in 4.1, I’ve been developing a JXPath extension which works ontop of the reflective EMF-API. I know that there’s already the possibility to query models using OCL but there are many more people familiar with XPath than the sometimes very cryptic OCL syntax. Some code samples might make clear why I think querying and navigating through EMF-Models using XPath is a very useful thing. As an example model I’m using the Library-Model which is well known to most people who’ve worked with EMF. The XPath-Code one can use with the new support is like this. I think the above shows how easy it is to navigate/query an EMF-Model-Instance using JXPath and using this new EMF-extension. I hope we’ll manage to integrate this support into one of the next Eclipse 4.1 I-builds until then you can access the source from the e4-cvs-repository. I’m also thinking about moving the code at some point to EMF directly because there’s no dependency on e4 and such an implementation could be of use for others as well. This entry was posted in e4, EMF. Bookmark the permalink. 2) There are many utilities for both the core and UI of EMF, that could/should have a home at Eclipse. But where should these be gathered (and who should decide their ‘worthyness’). I’ve developed similar thing in-house, I would like to try replacing it with your implementation since it’s probably nicer and more complete. Where in Eclipse CVS is this ? We have an XSD and generate Ecore from it with some renamings. In this case the ExtendedMetaData tags are filled and the XML parser/serializer is aware of these. But what about your (and other) XPath Tools? For me it seems reasonable to be aware of them because XPath only deals with XML and says nothing about Ecore. Also from an API point of view the XPath that points inside of an XML and the XML instance itself should be aligned. No ExtendedMetaData is not yet supported. The XPath is not executed on the XML-File but on the in memory representation of the EMF-Model. I’ll try to take a look at the ExtendedMetaData stuff to see if I can support it. To query th XML model one can save the EMF resource and query on the returned DOMDocument. You can use the DomHelper to map the returned nodes back to EObjects. I am new to EMF Query / Query 2 and after browsing through the standard and OCL query tutorials in the eclipse help content, I wish that the xpath support would already be available as third option (in 3.x eclipse/emf environments). You are so right when saying that “there are many more people familiar with XPath than the sometimes very cryptic OCL syntax”. I think it would crush the learning curve for emf query immensely. Is there already a bug / feature request to establish xpath as third option as query syntax for emf query? I’m a newer of EMF and XPath. I want to query point of interest from a xml file. But I failed to install JXPath with my eclipse. Is it not compatible with Mac OX? I can get XPath and XPathFactory but no XPathContext. Could you please give me some advice? 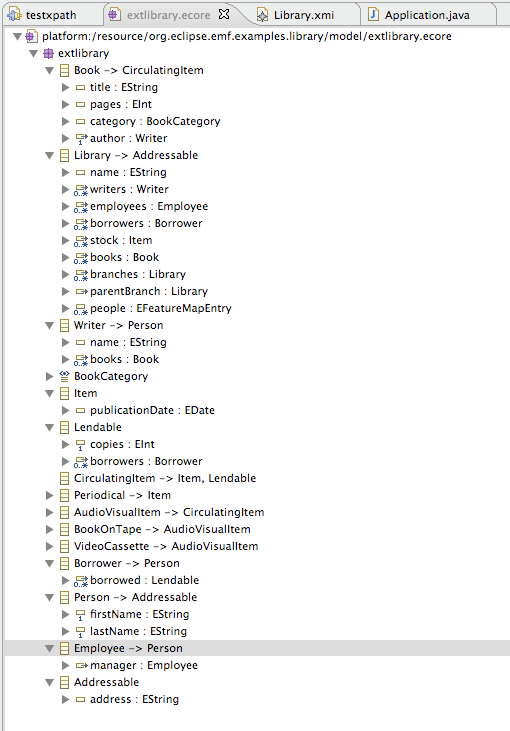 First of all – the library here is not executing queries on XML-Structures but their in memory representation. I’m not sure what you mean compatible. How did you try to install JXPath? I’m fine with JXPath now. I directly imported JXPath in build path. This looks very useful. Is there a way to install and use this on Eclipse 3.6? Sorry if this is obvious, but how do I go about installing it (and jxpath) then in 3.6? If I just need to use them as java packages where is the best place to get the jxpath-emf code? Thx. Hi Tom, I would like to use this tool for query a KDM instance meta-model. How can I get and install it?. I´m using eclipse 4.2. Hi Tom. Is this still the correct repo? Is an existing build for org.eclipse.e4.emf.xpath available through some p2 repo? yes the repo is still correct but IIRC it is not contained in any build. Nice. I just had a need for something like this again and tried to dig out an implementation of JXPath for EMF models I wrote nearly ten years ago (http://emfsearch.sourceforge.net/), but then I found yours first instead 🙂 Have you meanwhile introduced a function to query an object’s EClass? I think I had something like that in my implementation. I think I will try to see if my implementation still works in a new Eclipse since it also featured a simple UI.